– Biologist, researcher, presenter and steward. Ms. Aimee Mitchell (M.Sc, RPBio), has been involved in the field research, data analysis and provincial Wildlife Habitat Area report compilation aspects of various species at risk (SAR) (Western Painted Turtles, Red-legged frogs, Coastal Tailed Frogs, Northern Goshawks, Great Blue Herons) recovery work in BC through her position as an Intern Biologist at the BC Ministry of Environment in 2008-2010. 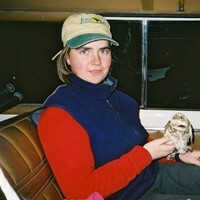 She continues to consult and advise governments, first nations, stewardship groups and private landowners all over the South Coast on species at risk conservation and recovery with targeted work on additional SAR including Western Screech Owls, Western Toads and listed Bat species. She also actively provides information and coordinates with all relevant SAR Recovery Teams/Working Groups and organizations involved in formal habitat protection and species designations. She is a member of the Western Painted Turtle Recovery Team, Coastal Painted Turtle and Great Blue Heron Working Groups, South Coast and BC Bat Teams, is the coordinator for the BC Community Bat Program for the Fraser Valley and Upper Sunshine Coast and has been a member of the BC College of Applied Biology as a Registered Professional Biologist since 2008. Come learn about bats on the South Coast! Ten species of bats occur on the South Coast of BC, all of which consume large quantities of insects annually. Many species of bats rely on human structures as maternity colony locations and it is important to educate the public and find ways to protect and monitor roosts to ensure their long-term persistence. This is especially important with the recent detection in Washington State of White-nose Syndrome, which has killed millions of bats in eastern North America. Because of this bats in BC are now even more at risk of having significant population declines in the near future. The BC Bat Team, BC Community Bat Program and South Coast Bat Conservation Society all work cooperatively to monitor and protect bat populations on the South Coast.